Baking with kids is a wonderful disaster. I was reminded of this last week when I made a Flourless Chocolate Tart. Let’s be clear- my family loved it. We gobbled it down. My boys (big and little) doused it with whipped cream and berries and devoured it. However it was not the kind of recipe that normally goes down in my kitchen. There was whipping of cream to specific consistencies, whipping of egg whites to specific peaks, and there was even a thermometer in there somewhere while whisking. All of this was happening while I was trying to hold my own in the epic Spiderman verses Buzz Lightyear verses Yoda verses Random Army Man battle with my oldest son. I’m pretty sure my youngest son was opening 17 containers of yogurt and conducting his own blind taste tests. It was good. SO good. And I hope you make it. However, today’s recipe is like putting on my comfy sweatshirt and wrapping my hand around my favorite coffee mug. It’s more my style for this season in my life. I can make it in about 5 minutes with little measuring, nothing about it is precise, and I can continue the good fight with Spiderman and Buzz. I think these are traditionally called Haystacks- I’ve been making them since my earliest days of being married and they’ve taken on many variations through the years. These days we’ve swapped out the peanut butter chips for cinnamon flavored chips, added Frosted Flakes to the mix, and topped with tiny leaf sprinkles. 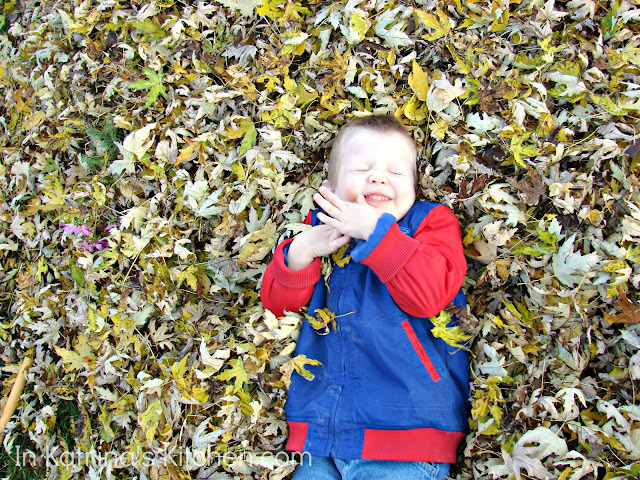 Is there anything more fun to watch than a kid jumping in a pile of leaves? I wanted a way to celebrate that joy and these little scotchies do just that. In a small, microwave safe bowl combine butterscotch, cinnamon chips, and shortening. Heat through until melted (first for 60 seconds then tapering to 30 second increments until combined). In a separate bowl combine cereal and broken up chow mein noodles. Pour butterscotch mixture over and stir. Drop by heaping tablespoons. Add sprinkles if desired. Once firm store in airtight container. Shortening is optional and is only used to thin out the butterscotch and cinnamon chips. You can omit it if you are uncomfortable using shortening. If you cannot find crunchy chow mein noodles you can substitute tiny pretzel sticks, coarsely chopped. I used cinnamon chips because we have a peanut allergy in our home. 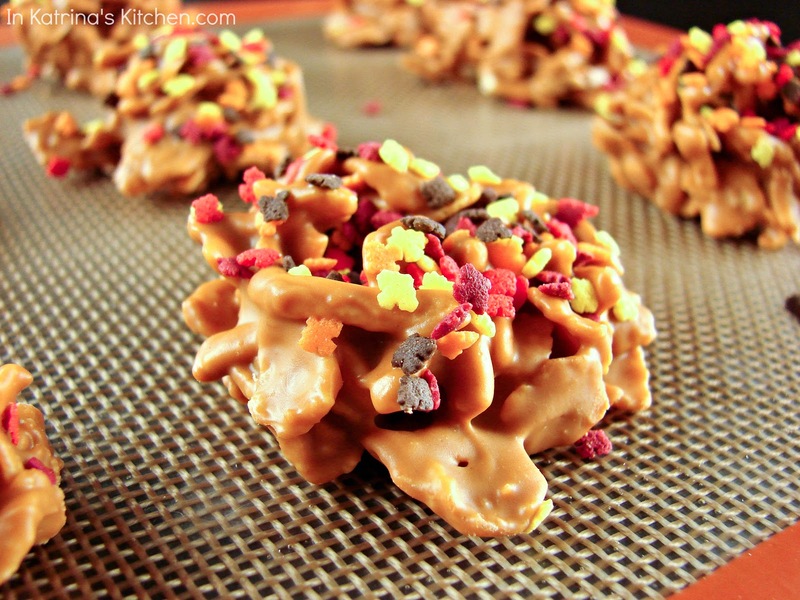 In the past I have made these with peanut butter chips. 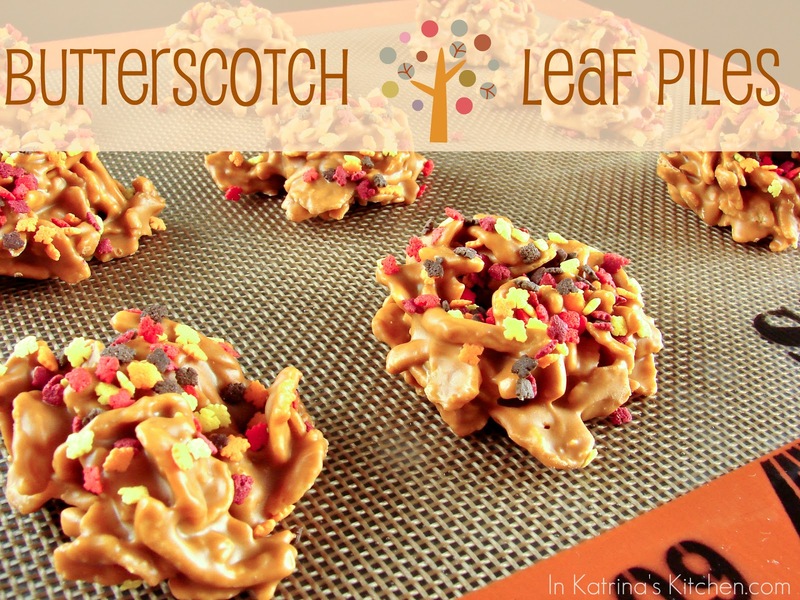 I think the cinnamon chips in place of the peanut butter sounds great with the butterscotch! I have had those baking moments with my kids too…crazy but so fun!!! Love these leaf piles!!! We made a chocolate version in middle school. OMG the memories lol. And seriously the epic battles in your kitchen and random taste testing… freaking hilarious! I want to put on my big sweatshirt and make these as soon as I finish my cup of coffee! Ana would looooove these! I adore these. Love how you made them "leaf piles!" Oh yes, baking with kids is always an adventure. I must admit, however, that they often come up with things far more creative than I do. These are so cute! What a yummy fall treat and the photo of your liitle guy in the leaves is adorable! I really love the fall colours! So pretty with the browns, reds, oranges, yellows… so nice! Okay. I LOVE LOVE LOVE LOVE LOVE these!! My son is going to FLIP out when he sees these!!! I cannot wait to show him. I mean, I really can't. I might take a picture to school and tap on the window at lunch just so he knows what fun he gets to come home to today! !